At the invitation of Msgr. Sako, 50 religious leaders are meeting during Ramadan to launch an appeal to political leaders for an end to conflicts and divisions. "We are all brothers, sons of the same God we must respect and cooperate for the good of the people and our country." Kirkuk (AsiaNews) – A strong appeal for national peace, reconciliation and end to violence from religious leaders, Christians and Muslims, in Kirkuk. Gathered in the Cathedral at the invitation of the Archbishop Louis Sako, 50 Christian and Muslim representatives will have dinner together. The archbishop explains that this is "a gesture of closeness to our Muslim brothers. We are all brothers, sons of the same God we must respect and cooperate for the good of the people and our country. " "Iraq - said Msgr. Sako - needs reconciliation and dialogue”. The participants include representatives of Ali Sistani and Muqtada al Sadr. The message, of which AsiaNews publishes a translation, will be distributed to media and policymakers in the city. "On the occasion of the holy month of Ramadan, we would like to express our warmest and sincere greetings to our Muslim brothers, so this may be a distinct and strong time for prayer, forgiveness and reconciliation, so it may create a safe environment in which our wounds may be healed and our concerns may recede, so that we can live in a climate of peace and joy. 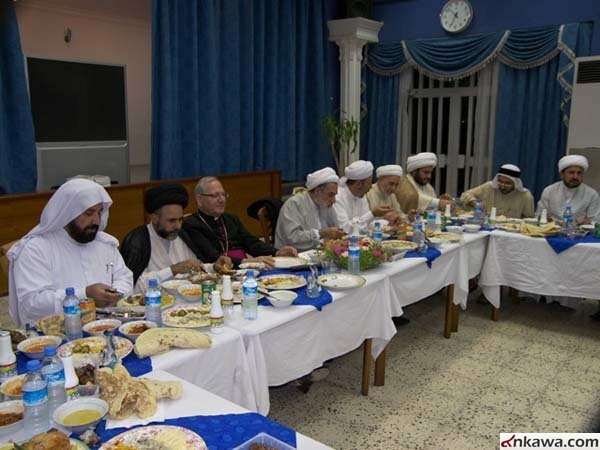 We are men of religion, Christians and Muslims, from all seven parts of Kirkuk, and without interfering in politics and controversy, but based on our humanitarian and religious commitment, we call on all parties concerned to solve the problem of Kirkuk, to adopt the language of reason and to sit together and engage in dialogue in order to find a political solution which safeguards the security of the people of the city and its unity. Allowing all components of the city brotherhood and coexistence. Factious words could lead to conflict, which leads to disaster for everyone, and does not resolve the issues. Therefore we ask all who have the power to take responsibility for finding the best way to solve existing problems and make the country safer and more stable, which contributes to the unity and cooperation. Iraq needs to be brave and responsible to its history. ... No more wars and violence, we want peace and stability. For our part, we recognize our ties. We are waiting for your prayers and good offices, and the construction of your dialogue to consolidate peace and promote stability. "